Well, you go away for a week and look what happens…there’s nothing like a directly elected mayor contest to flush out the children’s egos. Here’s a wee attempt to shed some light on what’s been happening in the madcap world of Tower Hamlets politics. June 24: as I blogged here, a Labour panel comprising London Assembly member Len Duvall, London Unison boss Linda Perks, and NEC members Ann Black and Keith Vaz MP select a shortlist of three: John Biggs, Cllr Shiria Khatun and Cllr Sirajul Islam. July 12: Labour suspends the contest after a legal challenge from Cllr Lutfur Rahman, who accuses the party of a stitch-up to exclude him from the list. Labour chiefs, concerned about the possible legal costs in defending such an action, decide to re-run the selection process. July 17: A new panel made up of the NEC’s Angela Eagle MP and Norma Stephenson (panel chair), and Ealing’s Chris Payne and Raj Jethra from the London regional party, select a shortlist of five. From the original three, they drop Siraj Islam (they considered him “borderline”), and add former Tower Hamlets council leader Michael Keith, current council boss Cllr Helal Abbas, and health worker Rosna Mortuza. July 18: Lutfur Rahman and Siraj Islam signal they will appeal on procedural grounds. They are then invited to have their appeals heard on Thursday, July 22. Lutfur can’t make that date for family reasons and agrees to go to party HQ on the Friday. July 22: Siraj’s appeal is heard and he is successful. July 23: Lutfur has his appeal heard by Jim Kennedy, a NEC member and senior official of the UCATT union. After a hearing of about an hour, Kennedy says the appeal had failed. After being informed, party general secretary Ray Collins leaves party HQ for the weekend. 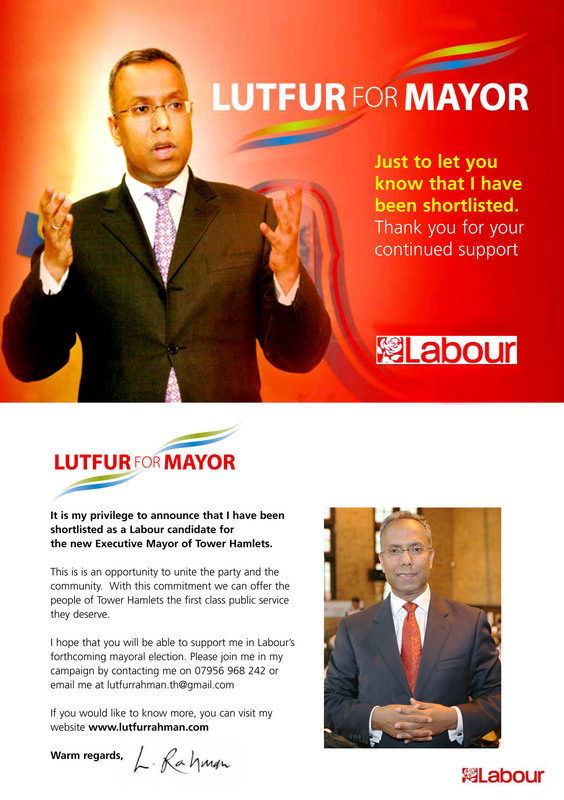 However, less than two hours later a letter is sent out to Lutfur telling him he had, in fact, been successful. The letter, shown here, is from Roy Kennedy, Labour’s director of compliance and a former director of the East Midlands Labour party. July 26: A delighted Lutfur issues his own leaflet and holds a press conference claiming victory. Meanwhile, party general secretary Ray Collins has gone ballistic. After talking to Jim Kennedy and other senior HQ officials, Lutfur’s exclusion is confirmed. Collins demands to know what’s happened. Party sources say questions are asked about the role of Keith Vaz MP. [For some reason, he certainly seems keen on an elected mayor system for Tower Hamlets (he appeared alongside Ken Livingstone and George Galloway calling for it at the Brady Centre in February, see report here. The sources also point out that Vaz was keen on Lutfur during the first interview process and that he later complained it was a fix. Perhaps significantly, they also point out that Vaz is a Leicester MP and is said to be close to Roy Kennedy, the former East Midlands party boss and the man who sent out the strange letter to Lutfur]. Collins demands Kennedy explain himself. At 7pm, Labour “clarifies” the situation by announcing that the shortlist will remain at five, ie Lutfur and Siraj remain excluded. The Labour Party has made another major blunder, this is the third time they have gone back and forth with the Tower Hamlets Mayoral elections to stop a Bengali candidate getting on to the shortlist. Please see below and attached. Labour & Tower Hamlets: Patronising – or just plain racist? It’s over a decade now since the last time Labour members in Tower Hamlets were last allowed to properly select their council candidates so we should not be surprised at another stitch-up. However, the latest shenanigans takes it all to a higher, more dangerous level. For the selection of the candidate for Mayor of Tower Hamlets, the shortlist imposed on local members included during the first round only three names: two from the local Bangla community, seemingly chosen to minimise the chances of selecting a Bangla candidate, and one white. Both the current Leader of the Council and his predecessor, both from the Bangla community, were both excluded. The first shortlisting was suspended due to major procedual flaw which was designed to exclude a strong Bengali candidate not to get in. The second round, saw an inclusion of two more members and the total candidates shortlisted grew to 5 but again they leave out the strong Bangladeshi candidate. After an appeal and legal challenge on Friday 23 July 2010, the strong Bangladeshi candidate, Cllr Lutfur Rahman was added on to the shortlist it also included further candidate, Cllr Shirajul Islam, and the total grew to 7. On Monday 26 July 2010 at 7.30pm, the Labour party head office sent a letter contradicting the appeal and excluding the final two candidate that were added, one of them being Lutfur Rahman. In the last round of council “selections”, local party members had no role: the panel was chosen by regional party appointees, and then allocated to wards by the Regional Director. Councillors were often allocated to wards other than the ones in which they lived or represented, and in some cases only shortly before the close of nominations. Normally regional interference in council selections is designed to remove any voices critical of the council leadership but in this case, the whole exercise was designed to topple the then Leader of the Council, Lutfur Rahman, who was the runner up in the parliamentary selection in Bethnal Green and Bow. Although Tower Hamlets is not without membership and voting irregularities, allegations have been made (but not necessarily substantiated) in many directions – including against Shiria Khatun <http://www.timesonline.co.uk/tol/news/politics/article7116273.ece> who is one of the lucky shortlisted candidates for Mayor. Lutfur Rahman, a university-educated partner in a respected local law firm who had been happy to describe himself as “New Labour”, has been accused (publicly at least) of nothing more than associating with people who have themselves been accused of no crime. The first beneficiary of the selection shenanigans was Councillor Helal Abbas who duly became Leader after Labour’s spectacular council victory (the best result since the landslide of 1994 at the height of the then Tory Government’s unpopularity). Meanwhile, the borough had voted to have a directly-elected Mayor. Labour’s policy (decided by the regional/national party without consultation locally) had been to oppose but, in Respect’s one victory of the night, the vote had gone in favour. Cllr Abbas would have been a strong candidate to be the candidate (indeed reports suggest that he has been announcing himself as such to community groups for some weeks) as would Cllr Rahman. The party bureacracy was clearly intent on stopping both. That decision is a disgrace. In a borough in which only 42% of the population is white British and where Banglas are the clear majority of the rest, many people of all ethnic and cultural backgrounds feel that Labour should be standing a Bangla candidate – especially when Labour’s support among Banglas is so fragile and in the face of the continuing presence of Respect in spite of their recent defeat. To impose a shortlist of only three and deprive party members of the chance to select either of the two most prominent Bangla candidates is a clear attempt to prevent the selection of any Bangla candidate. No-one is fooled by the inclusion of two lesser known and less experienced Bangla candidates, Shiria Khatun and Sirajul Islam. At best, it is manipulative and intensely patronising of the Bangla community; at worst, it is simply racist. Former Council Leader (sic) and current London Assembly member, John Biggs, who is the third person on the shortlist is not implicated and will almost certainly win the selection ballot to be held on 31st July. Leaving aside the depressing language of this email (surely, this whole saga has proved conclusively that communities are not homogenous blocs to be delivered on the basis of skin colour), where does the process now stand? If Lutfur does go to court, I’m told that Labour is confident it will win. At that point, Lutfur will have two main choices: he can either stand as an independent (something that most expect – he has serious financial backers among the Brick Lane business community); or he can remain in the Labour party and try to forge a deal with one of the existing candidates. His goal, and that of his backers, would be the ‘Mayor By Proxy’, so that he would actually be the power behind the throne. How would he do that? Well, he could say to one of the shortlisted candidates, “You let me pick a few of your cabinet members and the chair of the scrutiny committee, I’ll tell my supporters to vote for you on Saturday.” I’m told that Lutfur believes he has 270 votes within the Tower Hamlets Labour membership. Of those, 150 are said to be wholly under his direction whether he stands or not. In a contest in which the turnout is expected to be about 700, this is a significant number. Who would be tantalised by such a deal? There is some relief within Labour that Siraj Islam, widely considered a long shot, was eventually dropped from the list. And while all that was going, as the Guardian’s Dave Hill reports here, Neil King has been selected as the Tory candidate for Mayor. It may well be that given the above, they thought Neil’s background as a criminal barrister would come in handy…. It’s been pointed out to me that the “email” sent out by a “Lutfur supporter” was in fact an update of an article written on a website called Left Futures. The original post is here. The site is edited by Jon Lansman, who lives on the Isle of Dogs. He is a researcher to Labour MP Michael Meacher. Mr Lansman is not well liked by many other Tower Hamlets Labour members, it seems. In matters of fact, he is also inaccurate: John Biggs was never council leader. [UPDATE: I take that back: as Terry Fitz points out in the comments below, and as his London Assembly profile points out here, he was – I apologise!] He also levels allegations against Shiria Khatun: she rejects them out of hand, something she also did at the time. Thank you for explaining to me, as a local party member, what on earth has been going on over the past 2 weeks. As somebody who just pays their subs to the party, didn’t vote for an elected mayor but just wants to find somebody who can do the job properly since we’ve been lumbered with one, all I’ve been aware of is hastily cancelled hustings, legal challenges (with vague information about who and why) and e-mails from various candidates claiming to be on, or off, or on again the shortlist. This entire episode demonstrates precisely why certain individuals are unfit to be selected as a candidate for the mayoral post, even if they were to be shortlisted for selection. How are they supposed to put through major budget cuts which will be unpopular with councillors and residents if their response to not getting their own way is to launch legal appeals left right and centre. And they have to interact with other council leaders and Mayors – can you imagine the hissy fits between them and Sir Robin Wales if they don’t agree. At the same time the NEC appear to have been totally and spectacularly incompetent. John Biggs was leader of the council when Labour took it back from the Lib Dems in 1994. I made no accusation against Shiria Khatun. I merely reported that “allegations have been made (but not necessarily substantiated) in many directions” including against both Shiria and Khatun. Nothing factually inaccurate there. I look forward to your correction and further apology. The relevance of this is that successive panels have included Shiria but not Lutfur on the shortlist – demonstrating that they cannot have been rejected merely because an accusation had been made. What we have here is an old-fashioned witch-hunt in which one individual is hounded out of one office and barred from standing for another on the basis of innuendo and denunciation (in private). No-one is prepared to state any precise offence, no allegation is substantiated. And yet, the first panel was effectively prepared to (in effect) bar any Bangla candidate. Though the second panel has stepped back from that, Labour officials are still apparently “determined to clean up the party in Tower Hamlets.” Of what exactly? I have only lived here for 9 months (and, by the way, have found local Labour party members friendly and welcoming) and I cannot identify the problem. And yet we’re well into the second decade when Labour Party members are denied a free choice of candidates for public office – a situation everyone in Tower Hamlets Laour Party (publicly at least) wants to end. Jon, how exactly was Lutfur “hounded” out of office? He chose not to stand for group leader in May! Because he knew he did not have the numbers. (Or are you saying that he hounded Denise Jones out as council leader in May 2008?) And how was the first panel “prepared to (in effect) bar any Bangla (sic) candidate”? Of the three on that shortlist, it chose Sirajul Islam and Shiria Khatun, two British Bangladeshis. Why are you so keen to make race an issue, anyway? None of the candidates do so (in public, at least). With your short nine-month experience of Tower Hamlets, what do you think are the issues that should be being discussed? Lutfur was hounded out of office in the way that candidates were allocated to wards, in a deliberate attempt to rig the subsequent election of leader. Candidates were prevented from standing in the seats they lived in or had previously represented. So manipulative were these allocations that some wards (including wards Labour sought to win) had more than one change of candidate almost up to the close of nominations. And, to cap it all, a Labour MP chose to make outrageous allegations (insinuations rather than anything substantiated) against Lutfur shortly before the election on Channel 4’s Despatches programme. It didn’t damage Labour, but only because of the restraint and loyalty to Labour showed during the campaign by Lutfur. Unsurprisingly, however, he chose not to stand in a rigged election. Sirajul Islam and Shiria Khatun were put on the first shortlist in the knowledge that they were unlikely to win in order to provide cover against legal action – to avoid a repetition of the expensive legal defence it had to mount following a previous intervention in Birmingham. I do not seek to “make” race an issue. I believe that the underlying issue here is that some prominent Labour people have reactionary and patronising attitudes towards Banglas in Tower Hamlets and feel threatened by divisions within the Bangla community. They treat Bangla engagement with politics as somehow tribal and inferior (as if the Governments of Blair and Brown were not riven with tribalism). They’d like to get back to having the automatic support of the whole Bangla community. And, though they’d hate to think of it as racist, they’d sooner have a safe pair of white hands on the mayoralty, for now at least. My jewish antecedents grew up in the East End and engaged in its politics. I don’t think East End jewish politics was significantly different in its day in the way family, business and religion affected its engagement with local politics. They recruited family members (as I try to do by the way) and did each other favours and brought their disagreements into local politics. I have no doubt the Labour establishment felt alienated from them; maybe one of the establishment even walked out of a wedding at which men and women were separated. Labour’s understanding of and approach to racism, however, has changed or should have. No community is homogenous. We should trust the politics of the Bangla community to be played out within the democractic structures of the Labour Party. Intervention should be to protect the rights of members from abuse, but, as Tower Hamlets Labour decided yet again over recent days,such intervention is not justified. I may be new to Tower Hamlets, but I love it and plan to stay. I’ve been in the Labour Party for the last 36 years, and plan to spend the next 36, should I live so long, taking a keen interest in local as well as national and international politics. I think the issues we should be focussing on are housing and education, health and poverty. If Lutfur had been allowed to stand, I think he may well have been selected and I think he’d would have been (and will continue to be in other capacities) an excellent advocate on those issues. In his absence, I shall support John Biggs, who I think has the experience some others lack and will be the most inclusive of the potential mayors. I would be interested to know what Mr Lansman so condescendingly desribes people as “Banglas”. What planet is he living on? It sounds racist to me. What is he talking about “Shiria” and “Khatun”? Does he like repeating baseless allegations for the sake of it? This man is off the map. What an idiot – I hope he doesn’t stay in Tower Hamlets long. Lutfur is welcome to his “support”. My apologies – I meant Shiria and Lutfur. Anonymity and comradeship – not convincing! This seems rather contradictory to say the least. Thanks Matt. Not at all contradictory. Having/cultivating a group of friends and supporters within a party’s membership is somewhat different from saying that Bangladeshis will vote for a Bangladeshi candidate just because they are Bangladeshi. I’d say that kind of suggestion is patronising…at best. You believe he has 270; he would probably get 270 if he was in first race, in his absence others got commitment and difficult to persuade those made a commitments. I now know John is ahead and going to win comfortably. I think the party did a big favour to John by excluding Lutfur in first and Second process. Lutfur will have only one hustling where John did many.